SUCRE, Bolivia, Oct 17 2015 (IPS) - The hands of women who have migrated from rural areas carefully tend to their ecological vegetable gardens in the yards of their humble homes on the outskirts of Sucre, the official capital of Bolivia, in an effort to improve their families’ diets and incomes. “The men worked in the construction industry, and 78 percent of the women didn’t have work – they had no skills, they washed clothes for others or sold things at the market,” Lucrecia Toloba, secretary of “productive development and plural economy” in the government of the southeastern department of Chuquisaca, told IPS. Her hair in two thin braids and wearing traditional native dress – a bowler hat, a short, pleated skirt called a pollera, and light clothing for the mild climate of the Andean valleys – Toloba, a Quechua Indian, is an educator who now runs the National Urban and Peri-urban Agriculture Programme in the region. In her modest office, she explains that women are at the centre of the programme, which brings them recognition from their families and communities, diversifies their families’ diets, and offers them economic independence through the sale of the vegetables they grow ecologically in the city, which at the same time benefits from healthy, diversified fresh produce. Five km away, on the outskirts of the city, women in the neighbourhoods of 25 de Mayo and Litoral, who belong to the Sucre Association of Urban Producers, met IPS with a basket of fresh produce from their gardens, including shiny red tomatoes, colourful radishes and bright-green lettuce. A total of 83 poor suburban neighborhoods in Sucre are taking part in the project, which has the support of the national and departmental governments and of the . The initiative has 680 members so far, said Guido Zambrana, a young agronomist who runs the Urban Garden Project. The lunch we are served is soup made with vegetables grown in their backyard gardens, accompanied by tortillas made with cornmeal mixed with flour from different vegetables. Fresh produce is also grown in greenhouses built throughout the hills of Sucre, 2,760 metres above sea level and 420 km south of La Paz, the country’s political centre. The women have learned how to grow vegetables and how to improve their family’s food security, Tolaba explained.“We want to reach zero malnutrition,” she said. In Sucre temperatures range between 12 and 25 degrees Celcius. But in the greenhouses, built by the families with support from the government, temperatures climb above 30 degrees. Sometimes, the temperatures marked by the thermometers in the greenhouses spike and the windows have to be opened. The greenhouses have roofs made of transparent Agrofil plastic sheeting and walls of adobe. They are built under the guidance of technical agronomist Mery Fernández. The luscious leafy chard and lettuce in the greenhouse of Celia Padilla, who came to Sucre from an indigenous village in the neighbouring department of Potosí with her husband in 2000 and settled in Bicentenario, a neighbourhood in a flat area among the hills surrounding the city. 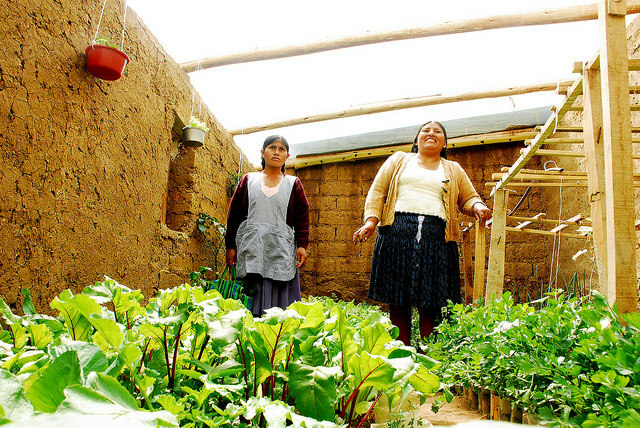 Padilla, who also belongs to the Quechua indigenous community like most of the women in the association, joined the project with a garden of just eight square metres last year, and is now thinking about building a 500-square-metre greenhouse. On average, according to FAO statistics, each greenhouse run by the Sucre association produces some 500 kg of fresh produce a year, in three harvests. And an average of 60 percent of the food grown goes to consumption by the families, while the rest is sold, either by the individual farmers, collectively, or through the association. A total of 17 different kinds of vegetables are grown, nine in each garden on average. The women and their families provide the land and the labour power in building the greenhouses. Besides planting and harvesting they select the seeds and make organic compost, in this sustainable community project. The Bolivian organisers of the programme say each greenhouse can produce an average income of at least 660 dollars a year. Her husband, a construction worker who does casual work in the city, is pleased with the idea of expanding the garden by building a greenhouse. Their home garden provides the family with nutritional food and brings in a not insignificant income through the sale of fresh produce to neighbours or at market. With the earnings, “I buy milk and meat for the kids,” Padilla told Tierramérica, holding bunches of shiny green chard in her hands. Water for irrigation is scarce, but a local government programme has donated 2,000-litre tanks to capture water during the rainy season and store it up for using in drip irrigation. 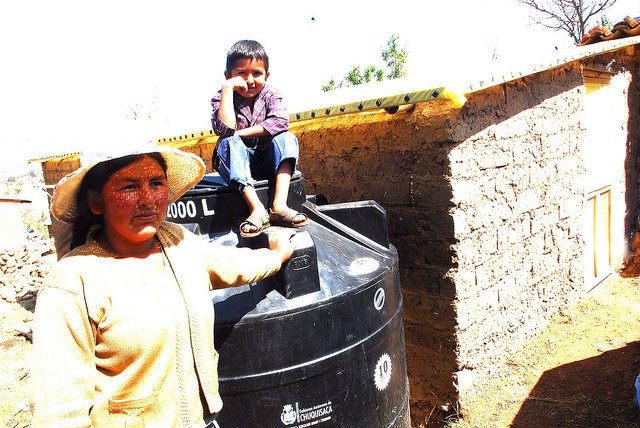 The chance to improve the family diet generated a good-natured dispute between Alberta Limachi and her husband, who came to this city from the village of Puca Puca, 64 km away. The couple, who own a 150-square-metre plot of land on the outskirts of the city, had to decide between a family garden or using the space to build a garage. Limachi, one of the leaders of the urban producers, won the argument. Her enthusiasm is contagious among her fellow urban farmers. 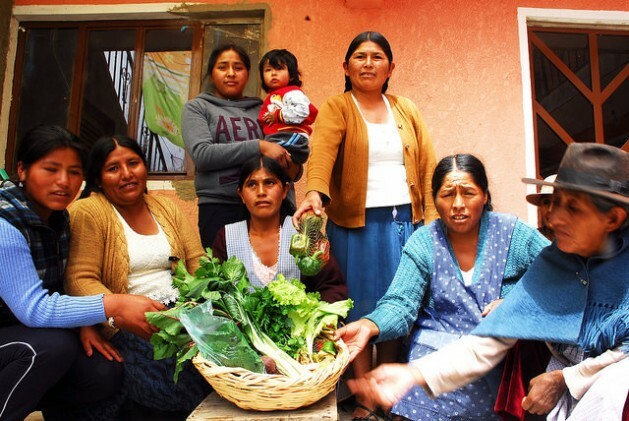 “We organised as women, and now we eat without worry because we grow our food free of chemicals,” she told Tierramérica, after proudly serving a snack of green beans and fresh salad. “I don’t ask my husband for money anymore, and we don’t spend anything on vegetables,” Padilla said, pleased to help support her family. Her garden is well-known in the neighbourhood because she grows lettuce, chard, celery, coriander and tomatoes, and her neighbours come knocking every day to buy fresh vegetables. A committee made up of associations of farmers and consumers monitors and certifies that the fresh produce is organic and of high quality, José Zuleta, the national coordinator of the Urban and Peri-urban Agriculture Programme, told Tierramérica. “The women grow their food without (chemical) fertiliser, using organic compost that can return to the soil, which means their production is sustainable,” Yusuke Kanae, an agronomist with the FAO office in Sucre, commented to Tierramérica. Kanae, originally from Japan, offers the women technical know-how and simple practices such as converting a creative variety of containers – ranging from a broken old football to plastic television set packaging – into improvised pots for growing vegetables. “Even if it’s just 20 bolivianos (slightly less than three dollars), the women can help buy notebooks and shoes,” said Kanae, to illustrate the importance of the women’s contribution to the household, which chips away at what he described as “sexist” dependence, while putting them in touch with their indigenous cultural roots. Kanae also supports the introduction of organic vegetables in the city, and has encouraged the owners of the Cóndor Café, a vegetarian restaurant, to buy products certified by the women as organic. Visitors to the restaurant enjoy substantial dishes prepared with the vegetables from the women’s peri-urban gardens, which combine Japanese and Bolivian cooking, and cost only three dollars a meal. The manager of the restaurant, Roger Sotomayor, told Tierramérica that he enjoys supporting the family garden initiative. “We want to encourage environmentally-friendly production of vegetables,” he said, stressing the high quality of the women’s produce and the fact that the cost is 20 percent lower than that of conventional crops.